The house is made up of 2 volumes, a day blockand a night block. The day block is a U-shaped volume set on a plateau at the top of the outcrop. It houses the shared living spaces, including the kitchen, the dining room, the living room and a reading nook, which is tucked behind the fireplace. The facades on the outside of this U-shape are clad in natural stone and pierced by openings that frame prime views. Floor to ceiling windows line the inside of the U and define a sheltered inner courtyard. The night block, which includes the master bedroom, consists of a 2-storey stone block that extends over the slope. Here, too, openings have been oriented and sized as a function of the vistas and the sun’s path. A generous window wraps around the southeast corner, for instance, to afford a stunning diagonal view over the woods. These 2 volumes are connected by a veranda and a fully glazed passageway. A large roof with an exposed timber frame of Douglas fir covers the entire house. Inside, the sense of a single volume is reinforced by the open space beneath the ceiling, with no partition extending to full height. Rooms that require privacy, like the bathroom in the day block, are capped by low ceilings that set them off as cubes within the space. The bathroom wall, which faces the inner courtyard, is a pivoting screen of frosted glass and steel. This feature ensures the optimal use of natural light and reinforces the notion of a fluid relationship between the spaces. The veranda is the space between the day blockand the night block. It is protected by the roof, which bridges the two sections. 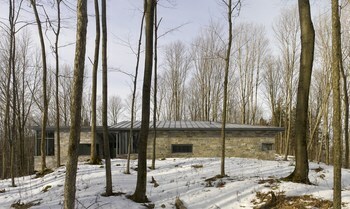 Its sheltered dining area provides a beautiful view of the woods and is oriented east to benefit from the morning sun. The veranda has a glazed corridor that creates a feeling of being outdoors, even in winter, when going from the day block to the night block. Awareness of the natural environment is always a part of life inside this home. Window and door openings are positioned and sized as a function of the viewer’s position and the landscape elements they frame. Because the house turns in on itself, several sight lines cross through the structure, looking inward at other areas of the home and outside at the same time. The building uses materials and construction methods that could be considered traditional or rustic, such as natural stone walls, a timber frame and a sloping standing seam roof. The form of the house, however, is unique, determined by the terrain and the desired relationship among the various functions of the structure. Distinctly modern features include clean lines, the use of large windows placed for optimal views and sun exposure (not according to classical composition), the open plan and various design details. Indeed, the spare aesthetics, simple and exposed structural components and use of natural and robust materials refer to both traditional building practices and a more modern perspective on design. Durable materials were chosen for the outside: stone for the walls and steel for the roof and columns—solid materials that stand the test of time. Inside, white, gray and black materials set the tone: bare stone, a concrete floor, glass, a galvanized steel structure and a gray-stained wood ceiling. The rest is white-painted drywall. Throughout, color is brought into the house by nature and its seasonal changes. The building offers a play on contrasts, as large opaque stone walls and generous glass surfaces set the stage for a compelling dialogue between inside and out.